Some foods soothe, lull and fade into the background. Some food you eat once, and never forget. That's the way it is with Thompson Brothers ribs and barbecue sauce. How to make family and friends “catch their breath”? 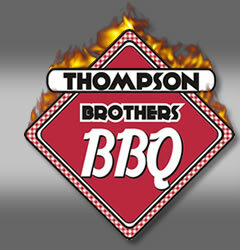 Try some Thompson Brothers BBQ! The holiday gathering. The birthday. The New Year. When families and friends gather there will always be moments that are warmly remembered, but perhaps none will remain with you longer than a very good meal shared by all. What is it that makes a meal memorable? Good food, company, conversation and a comfortable place to eat. Perhaps of equal importance is the place where the meal is to be enjoyed. A lasting experience should come together in surroundings that are both beautiful and inviting.You tell us where and you can depend on us to deliver delicious, hot, fresh barbeque on time. Come on in and try "The Whole Nine" with Barbeque Ribs, Chopped Beef , Bologna, & Beef Sausage. Have the sliced beef or sliced pork with our special barbeque sauces. And maybe our Home made Pineapple Upside-down Cake will satisfy your sweet tooth. What do you think about our barbeque? How was your service the last time you visited Thompson Brothers Barbeque? Tell us how we are doing and we may post your comment on our feedback page. Check out Thompson Brothers Barbeque in the November Issue of Atlanta Magazine .